Two great men of modern classical music are honored and commemorated by this important acquisition to the Belknap Collection for the Performing Arts. THE ROBERT STRASSBURG COLLECTION OF ERNEST BLOCH is a fascinating and fact-filled compilation of manuscript material gathered by the noted educator, composer, conductor and musicologist, Dr. Robert Strassburg (1915-2003), focusing on the career and life of one of the most renowned composers of the 20th Century, Ernest Bloch (1880-1959). Legendary cellist, Pablo Casals, called Ernest Bloch "the best composer of our time" and composer Alfredo Casella stated "..his art is one of grandeur and majesty which sometimes recalls the Moses of Michelangelo." High praise for one of the first distinguished European composers (others included Stravinsky, Schoenberg and Bartok) to make the United States his home in the early 1900s. Bloch's Jewish heritage was his greatest source of strength and creativity and was most visibly expressed during his "Jewish Cycle" of composition between 1912 and 1916. The music of the masters (Beethoven, Mahler and Debussy) was another great influence on the youthful Bloch, but he also demonstrated a neo-classical approach in his later quintets, quartets, suites, symphonies and especially in his EPIC RHAPSODY, AMERICA for orchestra, winner of the 1928 Musical America Prize. Bloch's compositions earned him world-wide acclaim, honors and awards, but his greatest and proudest accomplishment was the influence he had on his admirers and students including future composers Herbert Elwell, Randall Thompson, Roger Sessions and Robert Strassburg. The life, career and scholarship of Dr. Robert Strassburg, in many ways, parallels that of Ernest Bloch. Strassburg always expressed a passion for music. He would play up to eight hours a day as a classically trained concert pianist, but he also devoted his life to composing, conducting, teaching (Professor Emeritus of Music at California State University) and writing. In 1950, Strassburg moved to Miami where he became a key contributor to the southern Florida music scene, writing over 40 documentary film scores. 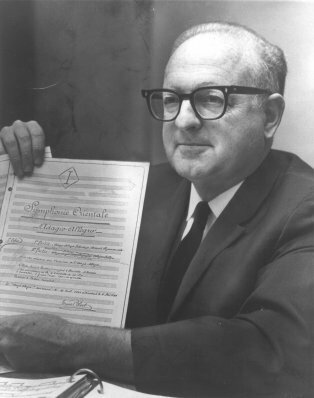 He founded the All Miami Youth Symphony Orchestra (now the Greater Miami Youth Symphony) in 1958. The Robert Strassburg Piano Concerto Competition is held each year to honor its founding director. In 1955, he was named Miami Composer of the Year. In addition to his personal musical accomplishments, Professor Strassburg is credited with being one of the world's leading authorities on the life and music of Ernest Bloch. 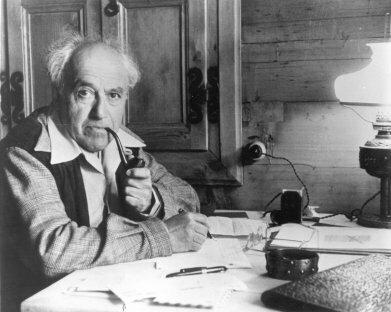 His critically acclaimed biography, ERNEST BLOCH: VOICE IN THE WILDERNESS (Trident Shop, California State University, 1977) was a labor of love and music scholars consider this biography to be THE textbook on the works of Ernest Bloch. Dr. Robert Strassburg's extensive research material (dating back to the late 1950s) on the career of Ernest Bloch (as well as his own career) is now housed in the Belknap Collection for the Performing Arts (17 boxes, 9 linear feet). This important collection of notes, articles, research sources, published and photocopied scores, drafts, galley proofs, photographs, correspondence with friends and family of Ernest Bloch and vinyl recordings was donated by Robert Strassburg's son, Dr. Marc Strassburg in October 2003. The Strassburg family chose the University of Florida, as the repository for this material, as a result of their contact with and respect for Dr. David Z. Kushner, the Head of Musicology and Music History in the University of Florida School of Music. Dr. Kushner is also a noted expert on the music of Ernest Bloch having published two respected works on the composer (ERNEST BLOCH: A GUIDE TO RESEARCH and THE ERNEST BLOCH COMPANION). Marc Strassburg wrote of Dr. Kushner: "...from your wonderful accomplishments and leading position as an academician in this area, I am positive that my father would be thrilled on my making this contact with you." We are grateful to Dr. Marc Strassburg for his generosity and we thank Professor Kushner for his tireless negotiations during this transaction with the Strassburg family. Their efforts on behalf of the University of Florida resulted in a treasure trove of material for the Belknap Collection and the Department of Special and Area Studies Collections. The preservation of the work of Dr. Robert Strassburg provides invaluable material for future scholars and researchers at the University of Florida and we are proud to add this resource to the collections. Dr. Robert Strassburg wrote: "The music of Ernest Bloch has an enduring quality about it. As it is rediscovered from year to year one discovers an increase in its power to stir the listener emotionally. It demands much of the listener, but is readily accessible..." The musical careers of Ernest Bloch and Robert Strassburg endure and are accessible for discovery in THE ROBERT STRASSBURG COLLECTION OF ERNEST BLOCH in the BELKNAP COLLECTION FOR THE PERFORMING ARTS. BOX 2 STRASSBURG: MISCELLANEOUS BIOGRAPHICAL INFORMATION - Includes correspondence, lecture notes, photographs, musical compositions, etc. relating to the life and career of Dr. Robert Strassburg - Filed alphabetically by subject. BOX 3-4-5 STRASSBURG: ERNEST BLOCH RESEARCH MATERIAL AND SOURCES - Includes Ernest Bloch biographical material researched and gathered by Robert Strassburg in preparation for his various publications - Filed alphabetically by subject. BOX 6 STRASSBURG: ERNEST BLOCH RESEARCH MATERIAL AND SOURCES: TRIBUTES AND CELEBRATIONS - Includes programs, heralds, articles and miscellaneous materials documenting the many tributes honoring Ernest Bloch during his lifetime and after his death in 1959 - Filed alphabetically by subject. BOX 7 STRASSBURG: ERNEST BLOCH RESEARCH MATERIAL AND SOURCES: IMAGES, PHOTOGRAPHS and NEGATIVES - Includes Ernest Bloch publicity and private photos used by Robert Strassburg for ERNEST BLOCH: VOICE IN THE WILDERNESS - Filed alphabetically by subject. BOX 8-9 STRASSBURG: PRE - PUBLICATION DRAFTS, GALLEY PROOFS and MISCELLANEOUS MATERIAL - Includes research notes, correspondence, drafts and galley proofs for Robert Strassburg's various Ernest Bloch publications - Filed chronologically. BOX 10-11-12-13-14 STRASSBURG: ERNEST BLOCH RESEARCH MATERIAL AND SOURCES - MUSICAL COMPOSITIONS - Robert Strassburg's research notes, articles and sources on most of Ernest Bloch's compositions gathered in preparation for his many Ernest Bloch publications - Filed alphabetically by composition title. BOX 15-16-17 STRASSBURG: ERNEST BLOCH RESEARCH MATERIAL AND SOURCES - 33 1/3 RPM RECORDINGS - Robert Strassburg's collection of recordings of Ernest Bloch compositions conducted and performed by Ernest Bloch and various artists - Filed alphabetically by artist. FOLDER 25 Credo Bloch's quote on the creative influence of his "inner voice"
FOLDER 17 San Francisco Conservatory of Music 1924 MASTER COURSE catalogue announcing classes to be given "personally by Ernest Bloch"
FOLDER 17 Oregon Honors Ernest Bloch 1976 calendar of events and program notes for winter and spring celebration of Ernest Bloch` "in the (United States) Bicentennial season"
Folder 8 Bloch, Ernest - Photograph (1928) Switzerland - Caption: "Ernest Bloch spends his summer in the Alps"
Folder 2 "Ernest Bloch: Voice in the Wilderness" Galley Proofs - Part 2 (1970) - Chamber Music - "never published"
Folder 7 Lillian REHBERG-GOODMAN, cello Meditation Hebraique and Three Pieces "From Jewish Life"
Copyright © 2003- University of Florida George A. Smathers Libraries.